JUDITH LANG ZAIMONT (b.1945): Sonata, Calendar Collection, Jupiter's Moons, Wizards - Three Magic Masters, Nocturne: Le fin de siècle, A Calendar Set - 12 Virtuosic Preludes, Cortège for Jack, Jazz Waltz, American City: Portrait of New York, Hitchin' - A Travellin' Groove, In my Lunchbox, Hesitation Rag, Reflective Rag, Judy's Rag, Serenade. 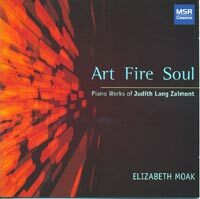 Description: Zaimont's idiom is always firmly grounded in tonality, and boldly colorful; the piano is her own instrument, hence the idiomatic flair with which she writes for it. The Sonata is a substantial work, adhering loosely to the conventions of the medium. Original and muscular, it consists of a discursive first movement, a cantabile slow movement, incorporating two scherzando sections by way of variety, and a rapid-running, rhythmically jerky perpetuum mobile finale. The attractive suite of atmospheric character-pieces based on both the astronomical characteristics and mythological associations of the names of five of Jupiter's moons invokes impressionism and mid-20th century American traditions - Copland, Piston - in a rhythmically quirky, modally-inflected tonality, as accessible as it is enjoyable. The Nocturne is unabashedly neo-romantic, while the varied set of preludes illustrates the characteristics of the months of the year, forming a strongly contrasted set, very tonal and pianistically idiomatic, atmospheric and appealing. The world première recordings here include the American City pieces of a precocious 12-year old (with one recent additional movement), the Lunchbox pieces, written for young pianists, and an example of the lively, humorous character pieces to which the composer has repeatedly turned during her career. A selection of inventive ragtime and jazz-influenced pieces round out this appealing collection. 2 CDs. Elizabeth Hoak (piano).